In this YA edition of Turia's bestseller, Unmasked, Turia shares her story about the fire that left her with 65% burns to her body after she was caught in a grass fire whilst competing in a marathon. She also shares her journey of her remarkable recovery. Turia offers some very helpful advice to her readers regarding self-esteem, confidence, and explores the benefits of having a positive mindset. The story is interspersed with sections of viewpoints from family and friends, including Turia's husband, Michael. 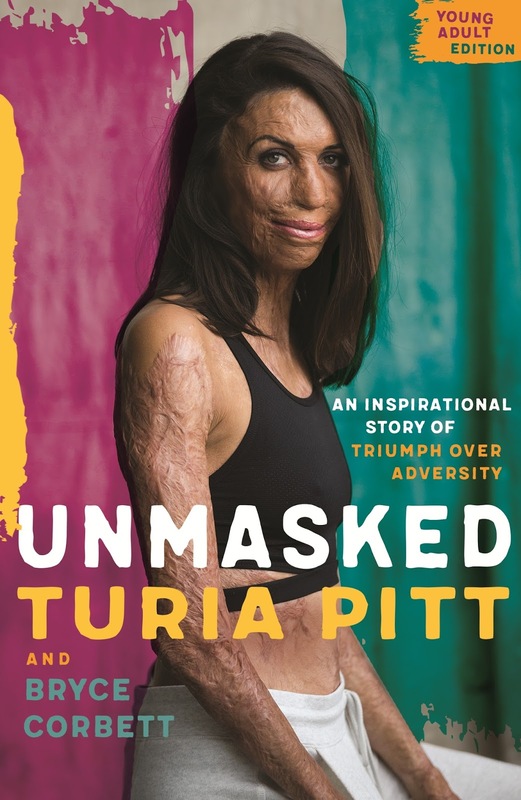 I was interested to read about Turia's work with Interplast, a not-for-profit organisation, and all of her fundraising efforts. I remember watching Turia Pitt's story on 60 Minutes some years back and was so moved by her story. I have been a follower of hers ever since. Unmasked is a truly inspirational read, and one I would highly recommend to both young and older readers alike.